Today’s blog I thought I’d do something a little different so I’m going to give you a Complete Body Workout that you can quickly and easily fit in at home. Helping improve the tone and appearance of your body, and add strength and support for your joints! All you need is yourself and some light weights/dumbbells. If you do not have weights then you can use tins of beans or small water bottles filled with water so you do not have to purchase weights! Complete each exercise 15 – 20 times and quickly move from 1 exercise to the other with no gaps in between. Once you have completed all of the exercises you can have a short break before repeating them all again 🙂 For beginners start with 1 set, and then gradually build it up to 3 sets in total! 1. 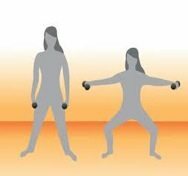 Squats with Lateral Raise – Stand with your feet shoulder width apart toes facing forward, weights in your hands by your sides. Keeping your back straight and tummy tight sit into a squat (as if you are sitting into a chair). As you are squatting move your arms straight out to the sides so that your hands/arms are level with your shoulders. Return the arms back down to your sides as you return to standing position and repeat. 3. Squats with shoulder press – Holding your weights close to your shoulders sit into a squat position. As you stand up push your arms up over head into a shoulder press. Repeat. 4. 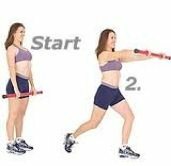 Lunge Kick with Bicep Curl – Keeping your balance stand in the lunge position and bring the back leg forward into a kick to the front and return to the rear back into lunge position. Continue reps on one leg before repeating with the other a bicep curl throught the movements. 5. Triceps Extension – Cross your weights and hold them above your head straight arms. Bend your elbows to take the weights towards the back of your neck and return straight up again overhead. Repeat. 6. Triceps Kick back – slight bend in the knees and leaning the body forward draw your elbows back to your side and keep them locked into place. Then straighten out your arms kicking back behind you and squeezing to feel the rear of the upper arms. 8. Bent over Fly – Keeping a similar bent over position as the bent over row but with the in front palms facing together. Slight bend in the elbows keeping the arms then locked in position fly your arms out to the side and then return to centre. Repeat. 10. Press up – Either the full press up, the intermediate press up or the box press up. Putting these exercises together quickly one after the other will help to add a cardio element to the workout, giving you a great workout and all over body toning at the same time! If you are stuck for time you can split them up to fit in to your busy today! The most successful and most highly recommended weight loss plan in the world is one that is based around eating healthily and exercising. People get scared at the word “exercise” but there is no need to. To exercise you don’t need to be able to run 100 metres in 10 seconds or have to train for a marathon or have to lift the heaviest weights at the gym. Going for a walk, working in the garden or chasing the kids – they all count. People get scared at the word “diet” or “weight loss” but again you don’t have to. If you are wanting to lose weight you don’t have to stop eating the food you like, you don’t have to eat ‘cardboard’ tasting meal replacments and you certainly don’t have to stop eating. More than likely you will end up actually eating more food than you currently are to lose weight? Weight loss is all about making the right choices, the right portion sizes, being consistent. Signing up to Why Weight Ireland will make losing weight and getting fit enjoyable. You won’t even think you are on a weight loss plan. You will receive your personal fitness plan that is based around your needs and abilities, you will get access to the amazing and fully comprehensive food and exercise diary as well as getting access to the support you need to get you through the tough times and there is much, much more including an optimised mobile site for all smartphones and iPads. I always said “it’s not just a diet, it’s a new way of life” and now most of our members are saying the same thing. They say they don’t see themselves as being on a diet, they are just eating healthily and exercising and most importantly, losing weight. Why don’t you look at the diary for yourself and you will see how easy it is. 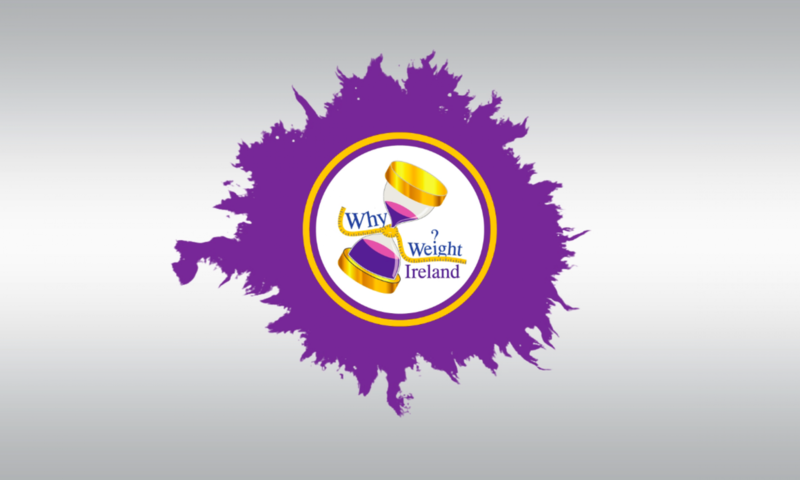 Visit www.whyweightireland.ie and check out the short video on the home page.